This holiday accommodation is perfect for friends and families who are looking for a relaxing weekend within easy driving from Sydney. If you're feeling nostalgic for long hot summers of a bygone era, a vacation at Whale Beach Villa with its magnificent ocean views will take you there in an instant. 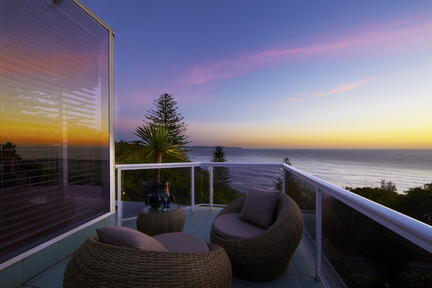 If you're after the most exquisite beach house come to Whale Beach, holiday letting doesn't getting any better! and spa this accommodation is perfect for your retreat from city life. Unique amongst holiday letting properties is that this also features a sauna! and a gourmet kitchen this holiday house exudes style and sophistication. The beach house has 5 bedrooms, Wi-Fi and private parking. Superior linen, towelling and Aesop toiletries.